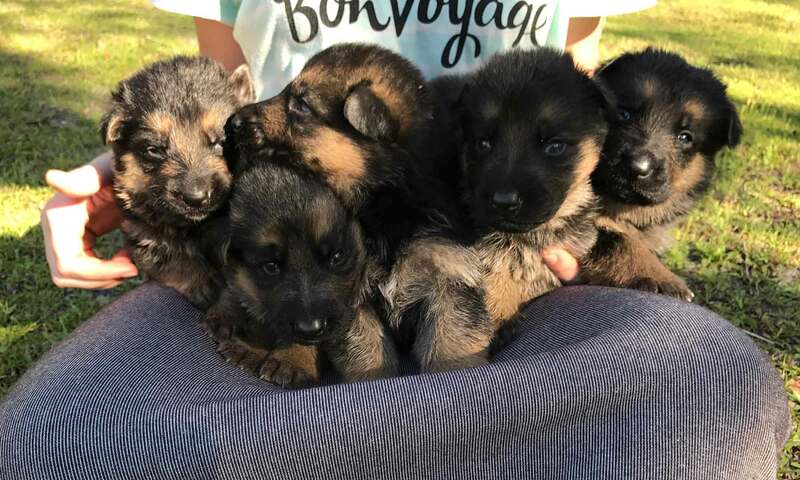 As a German Shepherd Breeder I have gone through many products and information over the years. Here is a compilation of what I recommend. For a free dog training podcast and great toys go to leerburg.com. I have used Leerburg training DVDs and products and they are wonderful. I have been feeding my dogs raw foods and Taste of the Wild Prairie. Taste of the Wild is a grain-free dog food which is very good for those sensitive to corn and fillers. Do a Google search to find a Dealer of this food near you. I easily find this food at my local feed store (that sells hay and horse supplies). My online website of choice for collars, pig ears, chew hooves and dog medicines is www.jeffers.com. Many customers ask me what flea product works best in Florida. During the past few years, it seems the fleas here in Florida have become immune to certain flea control. I spoke with my veterinarian about this concern and he recommended a product called ACTIVYL. This is a topical and it really does work. They also make one that helps with fleas and ticks. Check out www.amazon.com for best prices. I try to Avoid poisons– So I mainly use DoTerra Oils- I combine a few drops ea of Peppermint, Clove, Cedarwood, Tea Tree in a small sprayer bottle and spritz the ears and feet- this is Effective, Safe and smells good- no worrying about poison residue on your couch or children’s hands as they pet your dog. Another wonderful help is Brewers Yeast & Garlic pills that I get from jeffers; if your looking for a more natural alternative these pills and the oils work great with NO dangerous side affects. Hips & Elbows: If one of my Import German Shepherd dogs does not already have an “a” stamp then they are seen by a qualified veterinarian who does x-rays and results come from www.offa.org which is the orthopedic foundation for animals. Imports are all flown in from Frankfurt on Lufthansa. The dogs/puppies always arrive in good condition and well cared for. All my dogs have certified purebred pedigrees which can be found on the German Pedigree database website at pedigreedatabase.com. All my dogs are also registered with AKC. For information on AKC go to akc.org. See puppy registration page to see the process ( its quiet long 🙁 ) of registering an Import dog or puppy. In the many years I have been importing Shepherds I have never been denied any registration papers of my dogs and pups from AKC.